This Fast setting white adhesive is a popular option for tiling projects among professional contractors and DIY enthusiasts alike. It is easy to mix and use – providing a reliable adhesion between tile and substrate. The Fast setting properties ensure it is the perfect adhesive if you are looking to complete a job quickly and efficiently. 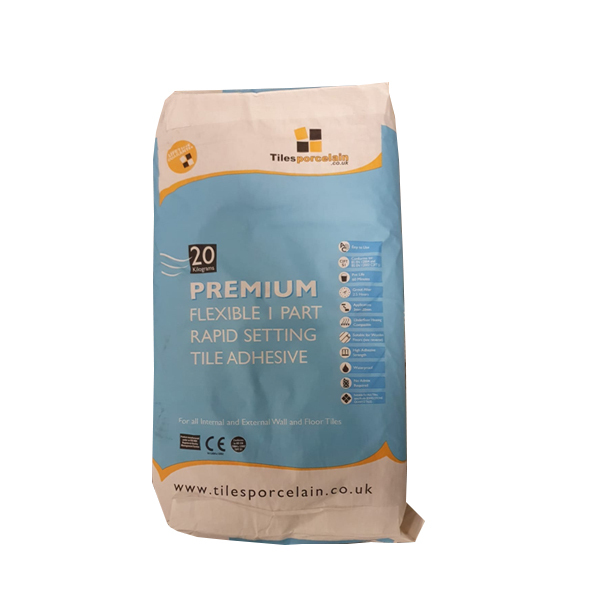 This white adhesive is suitable for fixing tiles on either a wall or floor substrate. Each bag covers approximately four squared metres. The sought after colour and high level of reliability makes this Fast Setting White Adhesive popular for a range of projects. This adhesive is also waterproof which makes it ideal for bathrooms. It is also compliant with underfloor heating systems. This single part White Adhesive does not require any admix as you simply combine with cold tap water for the recommended consistency. To maximise adhesion please ensure the surface you are about to tile is cleared of any dirt and debris. Follow instructions carefully on packet for a successful tiling project.